When you first use a Skin® condom you can feel the difference. Having spoken to lots of condom users and a little research of their own they looked to source the very best ingredients to ensure as natural an experience as possible. Skins teamed up with a condom expert of over 20 years’ experience with the local knowledge required to ensure only the best latex is selected for their condoms. By using premium quality latex, Skins are thinner than most condoms making them beautifully clear looking and natural feeling yet still as strong as other leading brands. Skins Condoms use a premium silicone lubricant for all their condoms and add a little more lube than usual. This extra lube combined with the fact that only the best powders are used in the manufacturing process means that the lube “migrates” further down the condom. This makes Skins really comfortable and more importantly reduces friction whilst in use, which is the biggest cause of splitting after jewellery, teeth and fingernails. 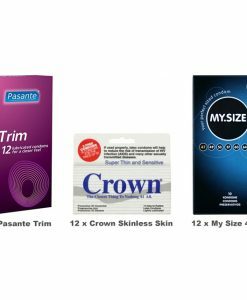 12 x Skins Ultra-Thin Condoms – Feel even closer to your partner with the strong yet amazingly thin Skins Ultra-Thin Condom. With all the characteristics of Skins Natural but even thinner, wearing one of these condoms is so close it feels like wearing a second skin. 12 x Skins Natural Condoms – Skins Naturals are easy and safe to use and interfere as little as possible with your enjoyment. They are the same thickness as most other brands’ ultra-thin condoms. 12 x Skins Dots & Ribs Condoms – Skins have combined raised ribs strategically placed for extra pleasure for him together with deliciously dainty dots all over giving heightened sensation for her. Working in harmony they maximise pleasure and enjoyment for both.